So far, the concoctions we’ve shared have been inspired by traditional holiday desserts. However, traditions have been changing and the Thanksgiving dishes being served have modified over the years to reflect the influence of other cultures. Just today I hear a story about a turkey that was prepared in the style of Peking duck with the flavors of Chinese five spice. While this is not what we have customarily, it provides an exciting alternative. In that spirit (pun intended), we’ve prepared a variation of classic cocktail originally created in Peru, the Pisco Sour. 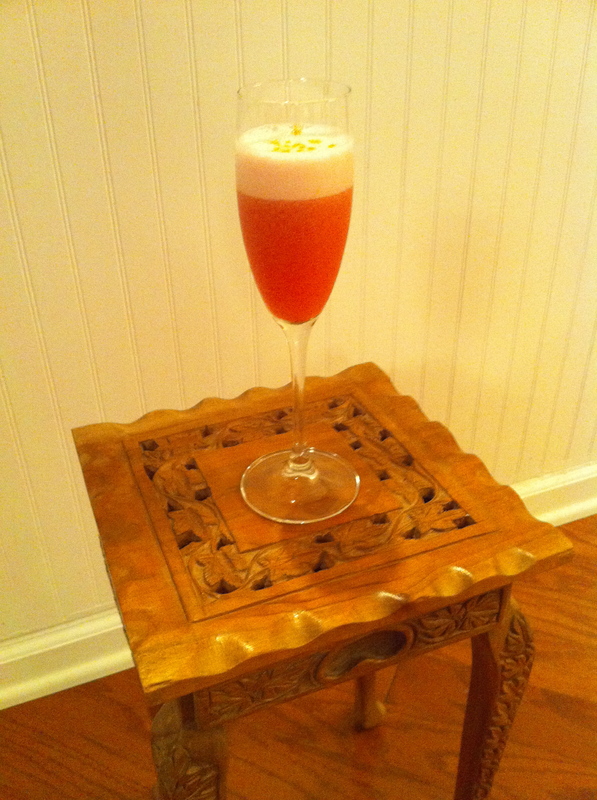 Our version utilizes the base of Pisco (grape based liquor) and egg white, but adds the flavors of ginger, cranberry, and spiciness of the bitters. It may sound odd at first, but give this cocktail a try and we think you may discover a new holiday favorite! Combine pisco, cranberry simple syrup, macerated cranberries, bitters, and lime juice in a cocktail shaker. Shake until frothy (about 20 seconds). Add ice and shake until well chilled. Pour into a champagne flute and add drops of bitters to top if desired. Slice ginger, place in a glass container (I use a bottle with a stopper), and pour in pisco to be infused. Let steep for 1-3 days or until desired strength of flavor is achieved. Combine all ingredients in a saucepan and cook on medium heat until the sugar is dissolved and the cranberries have burst. Strain syrup into a heat resistant container and set the macerated cranberries aside in a bowl. Previous Previous post: Have your pie and drink it too!